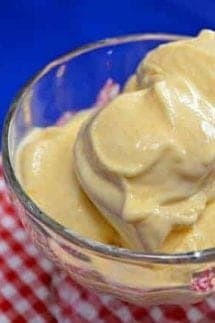 Chop the frozen peaches and place in a blender. In a bowl whisk the sugar into the cream. Add in the cream and sugar through the opening in the lid, stopping to stir the mixture. Place this mixture is a freezer container and freeze for 2 to 3 hours. If you have a Vitamix, simply add all ingredients to the mixer with the heavy cream on the bottom. Blend on high about 2 minutes until the four separate sections form on top.